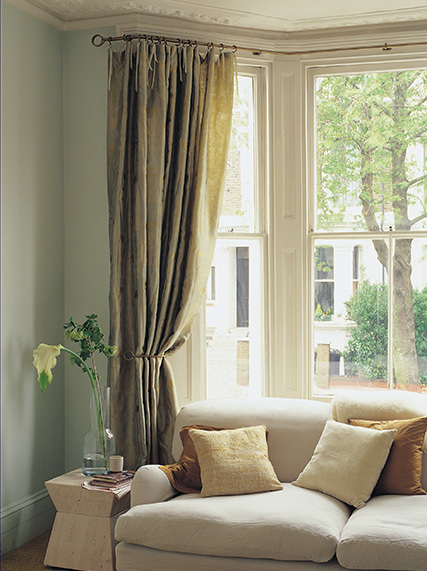 Fitting for bay windows and other challenging locations is our speciality. Whether you need a curtain pole, track or blind system we can provide a solution for any curves and angles in your home. We can help you choose from a selection of quality products that are specifically made for bay windows. Or we can work together to create a bespoke solution that fits your windows and taste perfectly. We can supply and install both corded, motorised and hand drawn curtain tracks and poles, in a great range of colours and designs, that function as perfectly in bay windows as they do on other windows in the home. Silent Gliss is the leading global supplier of curtain track and blind systems for bay windows to the high end market. Their products are designed for contract and retail markets that appreciate innovative products, exceptional quality and outstanding service. Cameron Fuller are a UK specialist manufacturing company based in Honiton, Devon. They design, make and supply metal and wooden curtain poles for bay windows, with fittings and accessories, from their Devon workshops.